Like so many cities all over the country — whether large or small — the motorcycle division of the Dallas Police Department is equipped with Harley-Davidsons exclusively. Effective traffic regulation is assured through the use of 35 solo Harley-Davidsons and 29 Servi-Cars. Traffic experts recognize that no other method matches motorcycles for efficiently handling so many phases of traffic control work and accident prevention. 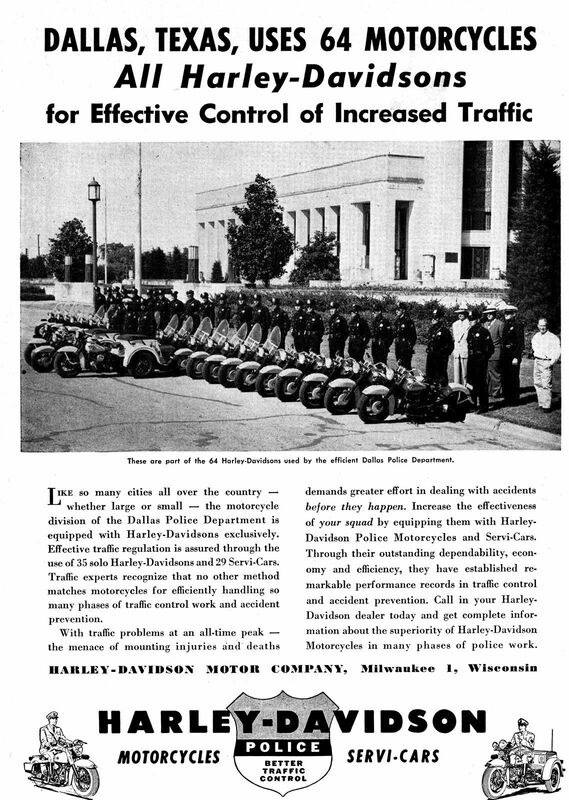 1951 Harley-Davidson ad from … somewhere — probably eBay. Back in 1910, the DPD was perfectly happy with Indian motorcycles, as can be seen in a previous post, “Dallas Motor Cycle Cops — 1910,” here. Click ad for much larger image.